This shoe is a very helpful aid for treating foot injury or disease that is subsequent to tension from the deep digital flexor tendon. It can reduce tension over the navicular bone, bursa and associated ligaments and reduce compressive forces on the sole corium, thereby aiding sole growth and a stronger, thicker wall. The mechanical properties can be further enhanced by forging more rocker action into the shoe. Less expensive alternative to our 6061-T6 aluminum shoes. T6 temper and hardness reduces wear and increases longevity. Comes pre-punched but not drilled allowing you to choose hole pitch. Optimum breakover properties enhance digital alignment and the natural healing environment. The Drop Forged Full Rocker Shoe is designed to offer high-end mechanical breakover. 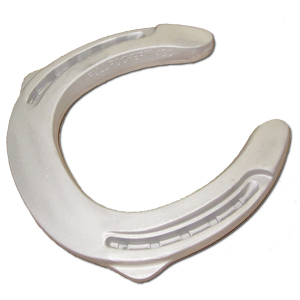 The breakover, or pivot point, of this shoe is located in the center of the shoe, which allows the horse to self-adjust its palmar angle. Horses with limited solar perfusion (blood supply) have little to no sole growth because there is a lack of sufficient nutrition to the trim line. By relieving deep digital flexor tension, blood supply to the laminae and sole is increased. This shoe offers continuous self-adjustment that the horse needs, even when standing still. The Drop Forged Full Rocker shoe is also an aid to enhance rigid sole growth, and it offers farriers and vets a new option for treating a variety of problems that are associated with thin, painful soles. Lateral radiographs are helpful in trim and shoe placement, as well as an aid to evaluate progress.